Designer Eric Lang (Blood Rage, Arcadia Quest) has done some great work over the years, so we were pretty excited to do this XCOM: The Board Game review before we even got our hands on it. Plus, it was made by Fantasy Flight Games, who seem to put out a handful of excellent games every year. 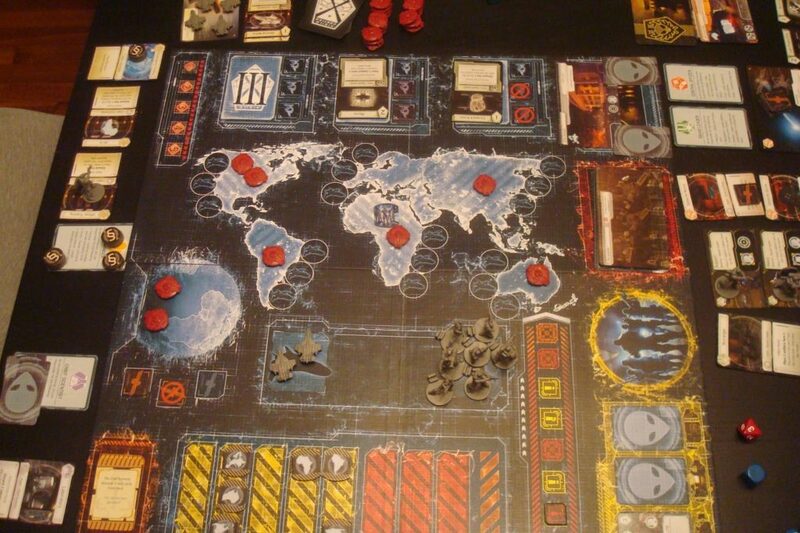 What is XCOM: The Board Game? 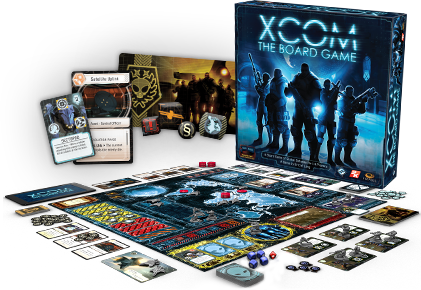 Based on the highly successful video game series, XCOM: The Board Game is a real-time Sci-Fi game in which players attempt to fight off invading UFOs in order to save the planet. Governments around the world are depending on you and your teammates to use your unique abilities to get the job done, but, trust me, it is not easy. XCOM: The Board Game won the 2015 Spiel der Spiele Griffin Scroll, which is an award given to the top fantasy or science fiction game. Things start off with players choosing between four different roles: the chief scientist, the commander, the central officer or the squad leader. Each role has a very specific set of actions and abilities, so each player is going to be focused on their own jobs throughout the game. The chief scientist will use the XCOM app to let everyone know what their tasks are and how much time they have to complete them. The game is divided into multiple rounds and two main phases: the timed phase and the resolution phase. During the timed phase, each player is given 10 to 20 seconds to carry out their tasks. These tasks include handling the budget, drawing cards, putting soldiers and alien spacecraft on the board, and many more. The key to the timed phase is making the right decisions for your team in a limited time frame. The resolution phase has players roll dice to see if their efforts during the timed phase were enough to hold back the bad guys. There is a lot of luck and risk taking during this phase. If two continents ever finish a round at the highest panic level, the players lose. In addition to that, if the invading aliens destroy the base, the players lose. Players need to complete the main mission’s objective to win the game. The XCOM app is FANTASTIC! Don’t worry about trying to find the rules online or a video tutorial because the app will walk you through everything you need to know. Also, the music and the timer add a great amount of tension and atmosphere to the game. The fact that there is no quarterbacking means that no one person can control the action. This is an issue that comes up in a lot of co-op board games, but it very rarely happens in this one. You have a very good cooperative experience where everyone feels like their jobs are important. You have to cooperative to be able to do well in this game. That is a great thing! The roles play differently, but you have to coordinate with each other to have a chance to win. XCOM: The Board Game is very challenging, so players can expect to lose a lot of games. Anyone who doesn’t like a game that is really difficult may not XCOM very much. Even after playing on the tutorial setting and the lowest difficulty, the game is still very hard to beat. It’s also worth pointing out that XCOM is not at its best with less than four people. Yes, the box says that it is for 1-4 players, but it is a completely different experience with three or fewer. Having one or two players take on multiple roles changes the game for the worse. The XCOM theme is certainly there in this game, but it isn’t as strong as we expected it to be. In the video games, you go on missions and fight off aliens in different environments with a squad of soldiers. In XCOM: The Board Game, you play as people behind the scenes that have to handle events all over the world simultaneously. That’s not necessarily a bad thing, but it just doesn’t really feel like a board game version of the video games. XCOM: The Board Game is worth checking out for the unique experience alone. Yes, the game is extremely difficult, but that makes winning so satisfying! It is a good choice for anyone who loves science fiction, and just about anyone who regularly plays games with three other people should at least give this game a chance. Just don’t go into it thinking that the XCOM tabletop game will have the same feel as the XCOM video games. Thanks for taking the time to read our XCOM: The Board Game review!